PEOPLE WANT TO GET BETTER. The arrangements are made, the details finalized, and the room is filled. You have one opportunity to grab the attention of attendees and show them this meeting matters. Make sure your hard work pays off by starting with a powerful opening message. My messages will energize your group, set the tone for the rest of your time together and set you up for success. These meaningful key-note addresses can be customized specifically for you and tailored to what you want to accomplish. I can work with you to make sure you don’t miss your chance to make a killer first impression. Some topics are below. Please note: All keynote addresses are customized for your audience and structured to accomplish your key goals. After all, it isn't about me, it's about you! One day you were moving along, excelling at your job and making progress in your career. The next you were put in charge of a group of others and given the responsibility of creating a team. Or perhaps you’ve been in charge of a team for a while but have recently added or lost members and the change didn’t just rock the boat, it nearly tipped it over! Or maybe you’ve finally come to terms with the fact that despite your efforts, your team isn’t performing to the level they could. Whatever your circumstance, you need help. You see the benefits of a cohesive, high-performing team, but you just can’t seem to get there. I can work alongside you and help you build a high-trust, high-performing team that recognizes, appreciates and plays to individual strengths while understanding and balancing the individual weaknesses every person has. High performing, low conflict teams don’t happen without direct intent and effort. And they don’t happen overnight. I can teach you specific team building skills that will have an immediate and long-term impact on your team. I can also work directly with your team to improve their performance and start them on the path to becoming a star performing team. Most companies today understand there is fundamental knowledge and basic skills your employees need to succeed. Without training in these areas, employee growth will stagnate. Your top performers will become frustrated and their work will suffer. Occasionally, this frustration will lead them to find training on their own. More often, your best employees will begin to look around. No matter the size of your company or your budget I can help you build into your employees. Know exactly what training you'd like to offer? I can do that! Not sure where to start? I can help you design a comprehensive training program. Want to look around and get some ideas of basic classes that every company should offer? Great! Any classes below can be delivered quickly and painlessly. Every class is customized to fit your needs. Some common topics are below. Take a look then call me. We'll figure it out. Regardless of where you are in an organization or life, we all need continual learning and development. Below are the most common topics that are holding individuals and teams back from being the best they can be. Every meeting, conversation or encounter is a chance to present. The way we handle a meeting or a room can have a profound impact on individual and company success. This course will help you overcome your individual presentation challenges, break down presentations into manageable parts, and learn the most important skills that will allow you to be yourself and wow any room. The goal of the Time Management class is to help you have a better, happier, less stressful life. Sounds like a lot to accomplish in a time management class? It is! But this class does more than teach you how to manage your time—it teaches you how to manage your energy so that you can be empowered and effective. At the end of the goal setting class you will have a step-by-step guide to help you set and achieve any goal. Not only that, this class helps you choose and set the right goals for you. You will learn to overcome failure, stay motivated and finally accomplish meaningful goals. We all have conversations we avoid, mostly because we tend to shy away from conflict. Instead of tackling issues as they happen, we let them fester and build. This course will allow you to understand your personal conflict history and style and teaches you how to have courageous conversations that solve the problem AND build the relationship! AWESÔME CLIMBS is a unique development opportunity that allows you to trade in your figurative uphill battles for a literal one! No more same ol' same ol'. This isn't your granddad's development program (although we'd love to have him come too!). It's real, raw, exciting and we want you to come with us. 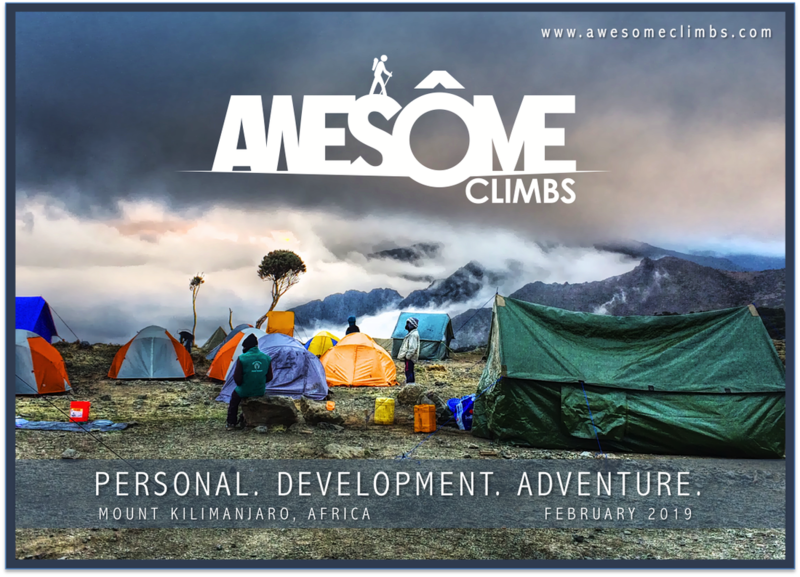 We take people just like you who are determined to succeed to the top of Mount Kilimanjaro in Tanzania, Africa and we facilitate powerful life lessons along the way. CLICK HERE for more information about joining us on a personal development adventure!